Fresh Beef Eye or Round Roast $4.99 lb Sale Price Product of Canada. $11.00 kg. Canada AAA. Aged 21 days.Greenhouse Tomatoes On The Vine $0.99 lb Sale Price Ontario home grown. No 1 grade. Foodland Ontario. $2.18 kg.Greenhouse Tomatoes On The Vine $0.99 lb Sale Price Ontario home grown. No 1 grade. 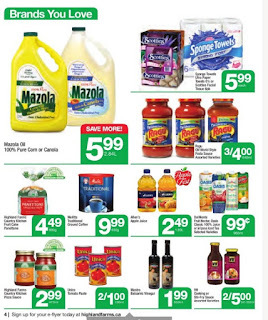 Foodland Ontario. 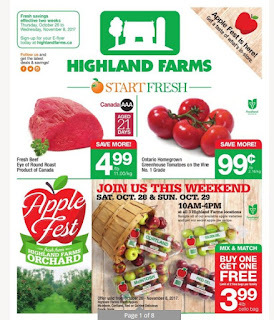 $2.18 kg.Mclntosh, Cortland, Red or Golden Delicous $3.99 Sale Price BOGO Free Savings Join us this weekend Sat. Oct. 28 & Sun. Oct. 29. 10AM-4PM. 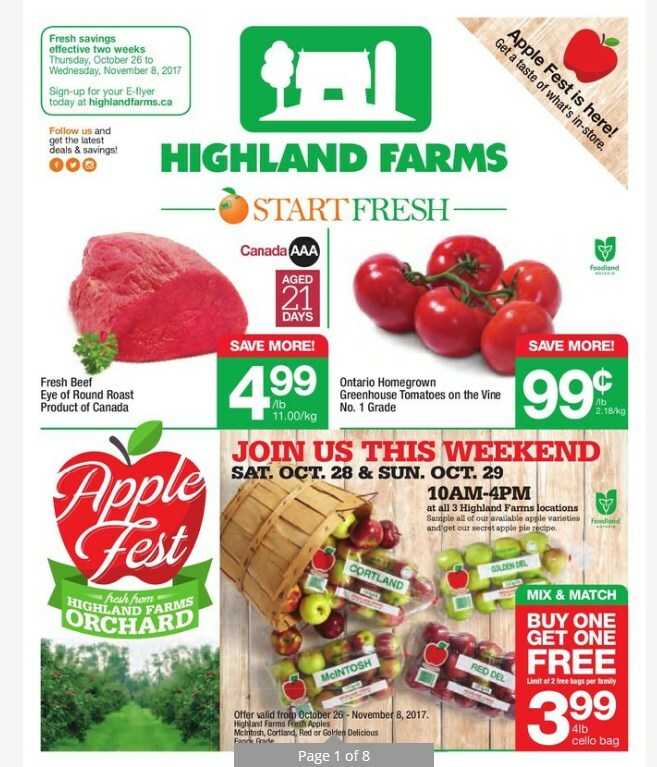 at all 3 highland farms locations sample all of our available apple varieties and get our secret apple pie recipe. Offer valid from October 26 Novermber 8, 2017. Highland farms fancy grade. 4 lb cello bag. 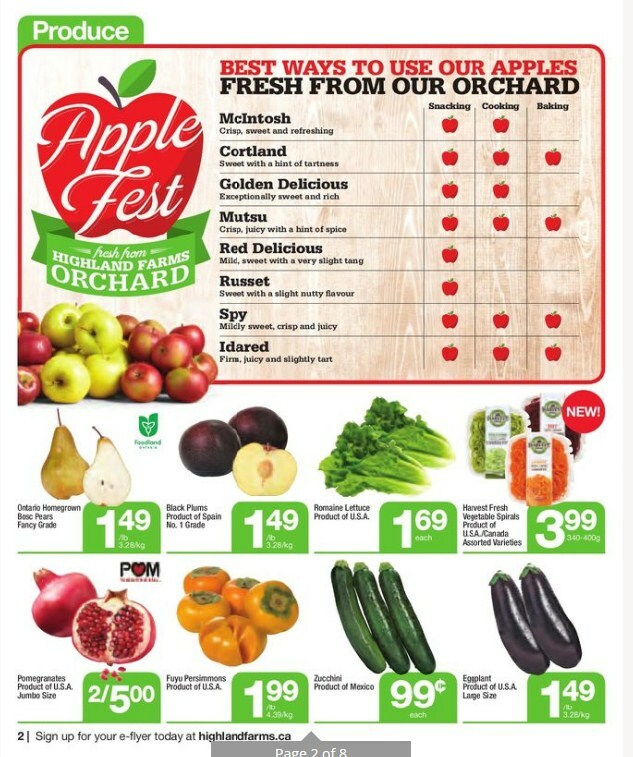 Bosc Pears $1.49 lb Sale Price $3.28 kg. Ontario homegrown bosc pears fancy grade. FoodlandOntario.Black Plums $1.49 lb Sale Price Product of Spain No. 1 grade. $3.28 kg. Romaine Lettuce $1.69 Sale Price Product of U.S.A.
Pomegranates 2 $5.00 Sale Price Product of U.S.A. jumbo size. Fuyu Persimmons $1.99 lb Sale Price Product of U.S.A. $4.39 kg. Zucchini $0.99 Sale Price Product of Mexico. Eggplant $1.49 lb Sale Price $3.28 kg. Product of U.S.A. large size. 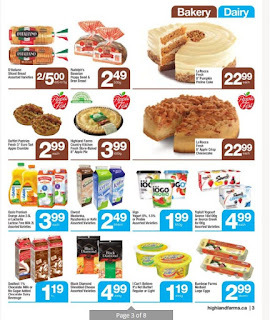 D'Italiano Sliced Bread 2 $5.00 Sale Price Assorted varieties 600-675 g.
Oasis Premium Orange Juice or Lactantia Lactose Free Milk $3.99 Sale Price Oasis premium orange juice 2.5 L or lactantia lactose free milk 2 L assorted varieties. 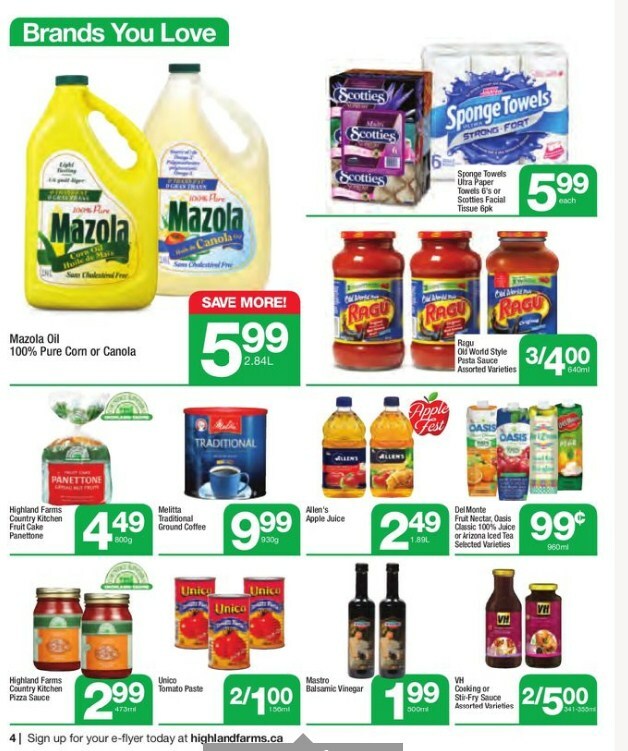 Elwest Maslanka, Ryazhenka or Kefir $2.49 944 ml Sale Price Assorted varieties. 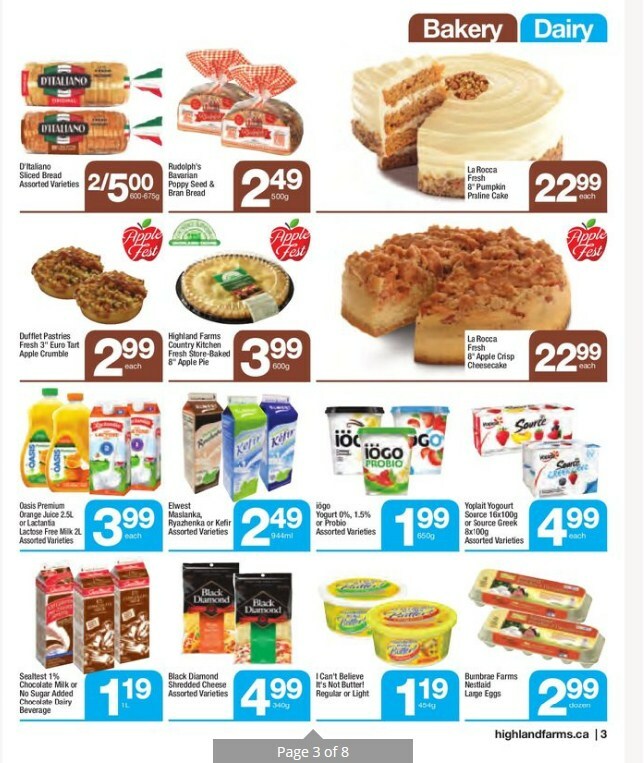 Iogo Yogurt 0%, 1.5% or Probio $1.99 650 g Sale Price Assorted varieties. Black Diamond Shredded Cheese $4.99 340 g Sale Price Assorted varieties. I Can't Believe It's No Butter $1.19 454 g Sale Price Regular or light.